Hot on the heels of the initial announcement comes this Empire Strikes Back trailer for Star Wars Pinball. 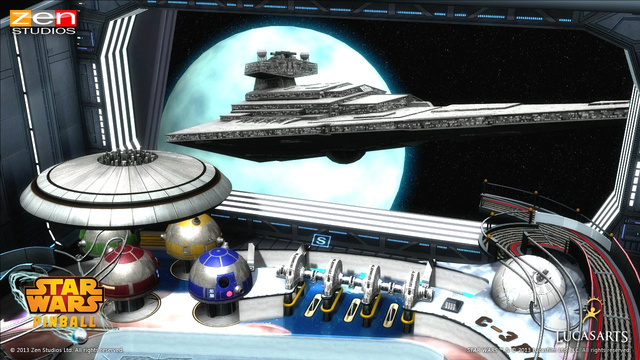 Much like Marvel Pinball, these tables will be packed together as downloadable content for Pinball FX 2, Zen Studios’ 360 platform for all things containing a silver ball. The trailer showcases the first of 10 tables with two others, Boba Fett and Clone Wars, currently announced. Additionally, GamesRadar was able to secure a 12-minute developer demo that showcases all three tables. Of note is the fact that Clone Wars narrator Tom Kane provides callouts on the table. The Boba Fett table features multiple bounties that culminate in a showdown with Corellian smuggler Han Solo. The Empire Strikes Back table will pit players against an Imperial AT-AT walker on Hoth and also features a trip to Cloud City. Sorry, we don’t know if Lando will try to make a move on you.